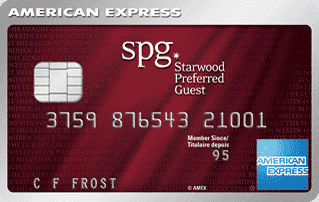 Good and bad news today for the Starwood Preferred Guest Credit Card from American Express. First lets get rid of the bad news, which in all reality isn't that bad. It's just bad because the promotional sign up bonus of 25,000 Starpoints ended yesterday and as of today is back to the 20,000 Starpoints. So yes it's 5,000 points less but even with a 20,000 Starpoints bonus this is card is still one of the front runners in our market. Just a slight punch to the gut if you didn't apply for it by yesterday as it would have been 5,000 points more. Alas 20,000 Starpoints is worth at least $400 in our minds if not way more than that. Onto the good news, a few months ago we learned the U.K. version of this card had extended the 2 Starpoints per dollar spent at Starwood and Marriott hotels the end of 2018. Since then we have been checking with Amex to see if an extension was coming on our Canadian version and we can officially tell you that yes it is! The Canadian card will continue to offer 2 Starpoints per dollar spent at Starwood and Marriott hotels around the globe until February 15, 2018. This is great news although I am still wondering why the U.K. version has extended their offer much longer than ours.